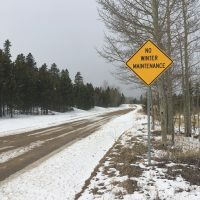 Snow is in the forecast for later today, the 10th of November, and it may be possible to groom and/or ski by November 11th at North Boulder Park. It’s common for folks to get pretty excited about this. It’s also common to get a lot of questions about several things. So, here are few things to keep in mind. By agreement with the City of Boulder, the BNC may groom North Boulder Park from about mid-October to early April. Volunteer groomers do the best they can with what conditions allow. Importantly, the BNC is obligated to mind the City’s turfs and infrastructure (like sprinklers) so, sometimes, groomers opt not to groom based on conditions. North Boulder Park’s irrigated grass surface makes it possible to ski with as little as 3″ of snow. An option to groom Foothills park remains in the agreement between the City and the BNC. However, it’s a lot of work to move the gear to Foothills so it’s an option that BNC volunteer groomers exercise only when conditions are excellent and forecast to stay that way for a good amount of time. For several years now, the Earth has been freezing later and thawing earlier in the season. Consequently, grooming at North Boulder Park and especially the northeast part of CU South have been complicated by snow melting from the bottom up. This phenomenon makes skiing hard. It also can make operating the grooming machinery virtually impossible. Conversely, the conditions at CU South are sometimes markedly better just a short distance to the west of the area by the tennis courts and close to where many people park. Right now, the BNC is ready to groom at North Boulder Park. The BNC’s grooming should be operational at CU South anytime in the next week or so. The land manager at CU South gives us a date range in which the BNC may operate and the BNC necessarily abides by those dates. Staging the gear at CU South is a bit more tricky as well. Also, the BNC is shuffling its machines for routine service on one and GPS installation on both. Bear with us and thank you, your membership dollars pay for thousands of dollars in operating costs. The BNC and skiers are guests at CU South. The dog walkers, runners, and others were there first. The equipment the BNC purchased (thanks to the community’s generous support) was selected for its ability to groom more and more quickly and, thus, regroom and resurface the snow on the corridors at CU South that may get heavy use in multiple modes in a single day. Some of the BNC’s older grooming implements often get stationed at CU South in order to make it possible to groom minimal coverage on CU South’s rough soils without damaging the nice, new groomer. Skiers at CU South are asked to be BNC members. This is a courtesy to the land manager who has considerately collaborated with the BNC. The only way the BNC can groom is by being a reliable partner to land managing agencies. 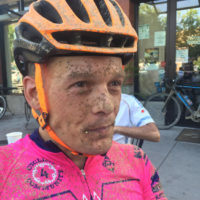 Given the ephemeral nature of snow in Boulder, let’s all just enjoy it, share the trails, and get along. The GPS real-time reporting system is almost complete. Each machine is getting its transmitter wired for power at this time. 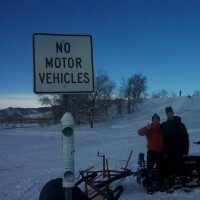 Go to http://skitrails.info/report/cusouth and http://skitrails.info/report/northboulder to see more. 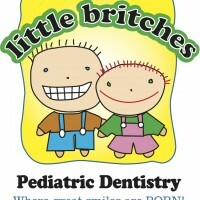 Thanks to Little Britches and The Next Level Pediatric and Young Adult Dentistry for Joining The BNC!